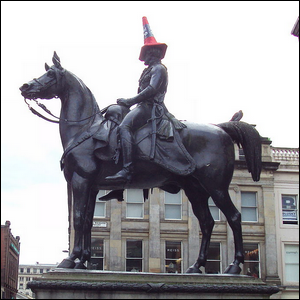 The City Of Glasgow Spends $15,000 A Year Keeping What Off Their Most Famous Statue? The Practice Of Firing A Purposefully Inaccurate Shot In A Pistol Duel Is Known As? Outside of the Gallery of Modern Art in Glasgow, Scotland, there is is a towering equestrian statue of the Duke of Wellington. Erected in 1844, the statue has become one of the more iconic landmarks in the city but not necessarily because Arthur Wellesley, First Duke of Wellington is a figure well known to modern viewers. Instead the notoriety of the statue stems from a local custom that dates back at least to the early 1980s: capping the Duke with a traffic cone. No one knows exactly when (or why) the practice started, but for over thirty years it has been a long running local prank to find a nearby traffic cone, scramble up the imposing statue, and place a cone upon the Duke’s head. In 2013, the city council proposed doubling the height of the plinth the statue rests on as part of a restoration project in a bid to keep down maintenance costs since it was costing roughly $15,000 a year to send workers out to carefully de-crown the Duke. Widespread public opposition terminated plans to change the plinth as the citizens of Glasgow had grown quite fond of the practice and considered it a reflection of their humorous ways.